"Is this not how you use the bathroom?" 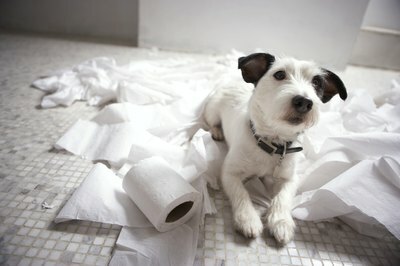 While pooping and peeing inside might seem disgusting to you, dogs have no problem with fouling up your floors. Some canines never get house trained because they were never given the opportunity. Others weren't trained properly, and some eliminate indoors because of medical conditions or behavioral problems. Negative reinforcement does sometimes help mold good behaviors, but it's typically more stressful to the dog and less effective than positive reinforcement. When it comes to house training, it's completely ineffective and does not hasten house training. When an owner rubs his dog's face in her own urine or feces, yells at her or smacks her, she has no idea that he's punishing her for going potty inside. She thinks he's angry for her going in that particular spot. What results is the dog relieving herself in areas where she thinks the owner won't notice. A lack of positive reinforcement -- rewards and praise for doing her business outside -- coupled with negative reinforcement typically leads to a complete failure of house training. Training puppies to do their business outside calls for frequent trips outdoors. The average youngster can hold her bladder for one hour plus her age in months. So a 2-month-old puppy needs to be ushered outside at least every three hours. The Humane Society of the United States suggests letting the little ones out every two hours. Puppies also need to be taken out after each meal, before bedtime and immediately after you wake up. Whether a product of a busy life or simply ignorance, some owners do not come close to following that schedule. If the pup rarely relieves herself outside, she's not going to learn that's where she needs to use the potty. A dog who has spent her entire life outdoors has no concept of house training. If she suddenly finds herself living in an indoor environment, she thinks squatting over the carpet is just as good as squatting over grass. Outdoor pups transitioning into an indoor environment react similarly to puppies who aren't house trained, and they require the same work. If they're not taken outside regularly and trained with positive reinforcement, they won't learn to eliminate outdoors. Sometimes indoor accidents have nothing to do with a lack of house training. Examples include medications and medical conditions that cause frequent urination or defecation, separation anxiety that causes a dog to relieve herself when her owners leave, urine marking and older canines with weak bladders. Your vet can confirm a medical condition or medication side effects, and help you implement a behavior modification plan for behavior-induced accidents. If you bring home a canine who isn't house trained, follow a few rules, and you'll likely have the pooch peeing and pooping outside regularly in a few weeks. If you have a puppy, follow the aforementioned potty schedule for puppies, and don't forget the age in months plus one hour guideline. If you're caring for an adult canine, follow the same schedule and take her out every three hours or so. She won't do her business each time, but it's always better to err on the side of caution. Regardless of your fluffy friend's age, always use positive reinforcement. Watch for signs that she's about to relieve herself inside, such as sniffing, circling and whining. If she starts to go, lead her outside or pick her up and hurry outside to let her finish. Do Labradors Get Along With Cats?